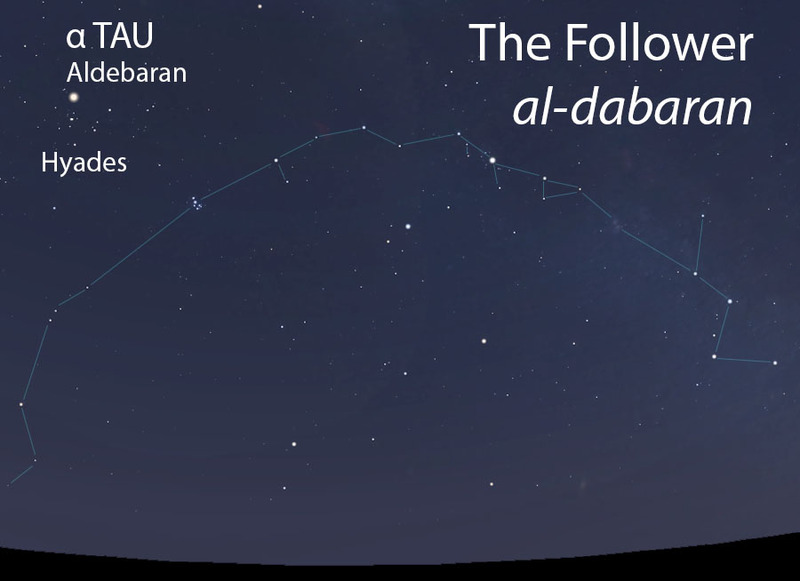 The Follower is a very bright, red star that immediately follows Thuraya as the stars move westward across the sky. The most honored star grouping in the sky, Thuraya was often called “the Asterism” (an-najm). 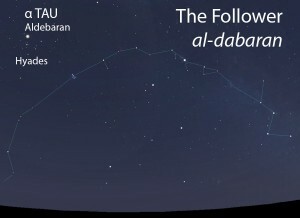 The Follower of Thuraya (ad-dabaran) as it appears in the west about 45 minutes before sunrise in early November. Sky simulations made with Stellarium. A very bright, red star located southeast of Thuraya, which is known in contemporary astronomy as the Pleiades star cluster. In the calendars of Qushayr and Qays, the morning setting of the Follower occurs after the end of the autumnal rainy season called al-wasmi. The Follower does not figure into the rain calendar at this point; instead, its pre-dawn rising 6 months later heralds the onset of al-hamim, the most vehement heat of summer. In early listings of the lunar stations, the Follower is the sixth station of the year. This was later changed to the fourth lunar station after the stations were adjusted to begin with the vernal equinox. The star of the Follower matches the Hindu nakshatra called Rohini. The Follower was the second star of summer (as-sayf) in the rising star calendar presented by Qutrub (d. 821 CE). The Follower is located just behind the Hands of Thuraya (aydi ath-thuraya, أيدي الثريا), and thus forms part of that folkloric celestial complex, which extends from the Amputated Hand (al-kaf al-jadhma’, الكف الجذماء) to the Henna-Dyed Hand (al-kaf al-khadib, الكف الخضيب).